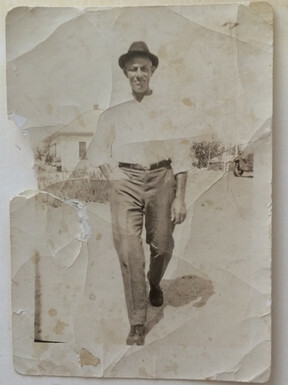 Our story starts with KL Wiens (our great grandpa), his full name Kornelius L. Wiens. It is said, he ‘jumped ship’ at age 17 to come to America from Prussia back in the late 1800s and he came to live in central Kansas to be with family. While there he met his wife to be, Agatha. They were wed in 1912 and moved to her family's area near Meade, Kansas where we currently farm. 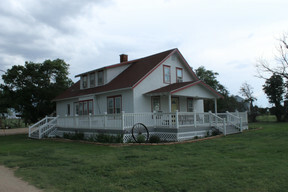 Agatha’s parents gave them 80 acres to farm and they built a small farmhouse on the land in 1925. By 1929 KL built our current house. (During the early years of their marriage KL worked the land and helped others build their homes). KL suffered hardships during his life with losing his brother in World War I and losing a child in a crib fire. Agatha and KL raised 6 children; Rolly (our grandfather) is the youngest of the 6. Agatha had complications in giving birth that resulted in her becoming crippled. KL continued to work hard and he aggressively bought and rented land to provide for his family. Grandpa will never forget July 4, 1949 at the age of 10, when he witnessed his father's death. Back in those days, tractors did not have cabs and were operated with a hand clutch. 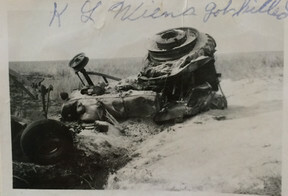 On this day, as he maneuvered the tractor to get out of a washout, the tractor reared over backwards crushing KL and killing him instantly. It immediately burst into flames. They had the funeral in their home; there were so many people they could barely fit inside the farmhouse. Because of his father's death, at age 10, Rolly took on more responsibilities with the help of family and friends. Rolly bought his first piece of land at age 15. Rolly went to Tabor College in Hillsboro, Kansas. Where he met and eventually wed Marge Busenitz a fellow college student studying to be an elementary teacher. 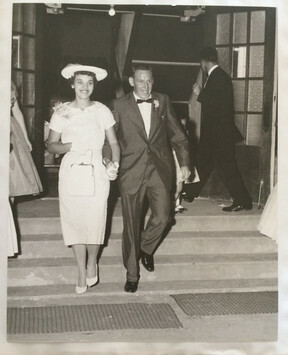 They were married in 1959. They spent their first year with Marge teaching 6th grade and Rolly working as a scrub nurse. They decided to come back to the family farm the next year. When they returned to Meade, Rolly farmed and supplemented their income with an off farm job. He also had 30 cows and calves. Eventually he started his own custom bailing work and also rented land to farm (Rolly and Marge were also aggressive in buying land and rented land when they could in the hopes to do more farming). They bought the original farmhouse from Rolly's mother, Agatha, and there they raised three children, 2 girls and one boy (Jerome) who is our dad. Jerome also attended Tabor College with a major in agriculture. Jerome stayed in prayer to know what God might have him to do for a career. Jerome married his high school sweetheart, Anita Newby, in 1984, who also attended Tabor college with a major in Elementary Education and they moved back to Meade. Rolly and Jerome worked together for many years and built up the cattle side of the farm by starting calves and feeding them throughout the winter. They continued to rent land to grow wheat and feed for cattle. Rolly and Marge received the Kansas Master Farmers and Master Farm Homemakers award in 1998 from Kansas State University.. In 2004, Jerome began taking over the management so that Rolly could step back from all the responsibilities of what was now Double W Farms. Jerome continued to buy yearlings and grow them throughout the winter and sell them in the fall. Jerome, along with his wife Anita, stayed busy on the farm growing wheat, feed to bail for cattle, and occasionally milo. Jerome and Anita raised four children 3 boys and 1 girl. His oldest boy, Bradon (my husband), loved farm work growing up and found every opportunity to stay outside helping out around the farm. 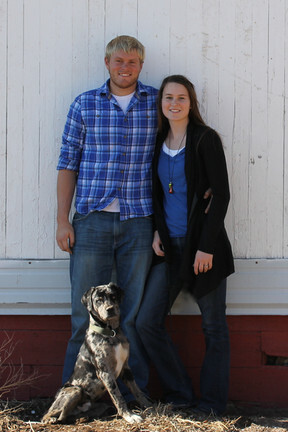 Bradon decided to go to college to first see other options for careers before settling on working for Double W Farms. After a few years he decided that farming and ranching might just be the thing for him and started working full time for his dad in 2011. Bradon and I knew each other in high school and we reconnected during college. We were married December 2013. Like Rolly, our cattle operation started with just 30 Cows and calfs and we have started breeding Fullblood Wagyu Cattle in the hopes of providing for our family one day. After marriage, Bradon and I moved into the original farmhouse (that KL built). Bradon worked for his Dad on the farm and I taught in town k-12 Art. Bradon has always had a passion for cooking and grilling. That love collided with his love for cattle when he learned of the Wagyu breed and ate a Wagyu steak. The chance to raise such world class beef was irresistible to Bradon. He set out to become the best he could at raising this breed by surrounding himself with the best in Wagyu in America. He continues to better his cattle by studying the breed, working with highly respected nutritionist of Wagyu cattle and by being counseled by highly respected Wagyu breeders in America. We purchased your Hickory Smoked Cured Beef – (deli sliced) at the Bentonville, AR Farmer’s Market. Upon the suggestion of the salesman, we made Reuben sandwiches with it. They were delicious! We plan to buy the steaks next! Thank You!